Postcards are a great way to promote your growing business! 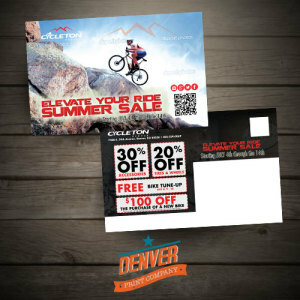 Denver Print Company offers a wide variety of sizes, finishes, and stocks for your custom postcard printing needs. Postcards work well for any business. They help spread the word about upcoming events, invite clients back to your store, offer new services, or serve as a coupon that is begging to be redeemed. A design and print that attracts attention in a jumble of “junk mail” is key to the success and postcard campaign. The talented team at Denver Print Company has printed hundreds of thousands of postcards over the years and we like to think we know a thing or two about what works and what doesn’t. Not sure if your postcard is right for your target audience? Send us your current artwork and let us give you an honest critique! We have designed postcards for beauty salons, barbershops, restaurants, bars, clubs, event centers, dispensaries, cleaning services and pretty much any other small business operating in Denver. We are happy to help you revise and improve your marketing in whatever way we can. Postcards come in quantities of 250, 500, 1000, 2500, 5000 and 10,000 pieces printed our high gloss or matte card stocks. Whether you’re planning a special birthday party, sale, promotion or bringing the next big DJ / rock band to town, the talented graphic design team at Denver Print Company is here to help bring your vision to life. We use the latest designs in technology and we have the equipment and expertise to design stunning postcards. Contact us today for a free consultation and take advantage of our expert advice. With over 10 years of promotional printing experience we have seen things that work and stuff that just doesn’t. Add a QR code to your custom printing. Need help designing your wedding invitation, event flyers, promotional gift cards or sale flyer. Give the talented graphic design team at Denver Print Company a call. 3 days from the confirmation of digital or printed proof.